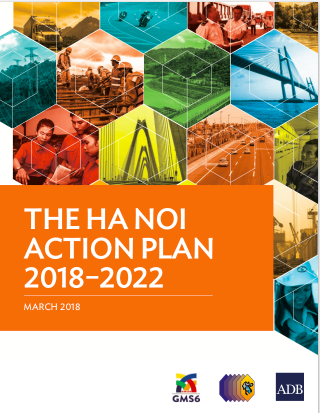 The Ha Noi Action Plan 2018–2022 reflects the Greater Mekong Subregion (GMS) Program’s agenda for the remaining 5 years of the GMS Economic Cooperation Program Strategic Framework 2012–2022. The action plan lays down both the unfinished and expanded agenda for the medium term. It also guides the Regional Investment Framework, which identifies the pipeline of GMS projects. 1. A spatial strategy focused on economic corridors. GMS economic corridors are considered as a network, instead of as independent individual corridors. Multisector area plans for priority areas along the corridors (clusters of urban areas and border areas) will be prepared. There will be a better balance of external connectivity with domestic connectivity to foster a more equitable distribution of the benefits of growth. Transport: Promote intermodal links, transport facilitation, logistics development, road safety, and asset management. Urban development: Focus on urban systems as part of spatial planning on aGMS wide basis, linking urban areas. Energy: Power market integration remains a priority and focus will be on grid-to-grid power trade between any two countries and later through transmission lines of third countries. Agriculture: Promote the value-chain approach to safe and environment-friendly agriculture products. Environment: Pursue ecosystem-based service approach to landscapes in the GMS Program and the Regional Investment Framework, and in international frameworks. Tourism: Improve quality and visitor experience, develop secondary tourism destinations, and develop human resources through competency-based training linked to standards of the Association of Southeast Asian Nations. Trade facilitation: Prioritize customs modernization, coordinated border management, and risk-based approaches to sanitary and phyto-sanitary standards. Human resource development: Focus on subregional health issues and engage other development partners in labor and migration, social development, and technical and vocational training. Information and communication technology: Promote ICT applications, address digital divides, and foster ICT innovations. pursuing a more systematic approach to resource mobilization. strengthening the role of the Senior Officials Meeting as an oversight and coordination body for the working groups.